Now that's an unexpected combination. 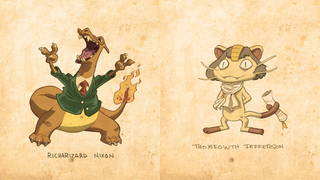 And if the drawings weren't enough, artist Brandon Dayton added new pun names too for these Pokémon Presidents. Makes me wonder who the others, the ones not included here, might be as Poképrez. There's more on the artist's Etsy site and you can also get all of them as prints.